A veteran of the NFL has decided to hang up the helmet for the third time, and it looks final. An NFL spokesman confirmed Monday that Brett Favre, who spent 20 momentous seasons in the league, filed his retirement papers. The 41-year-old quarterback for the Minnesota Vikings came off a disappointing season with 11 touchdowns in 13 games and was intercepted 19 times, finishing with a low 69.9 passer rating. 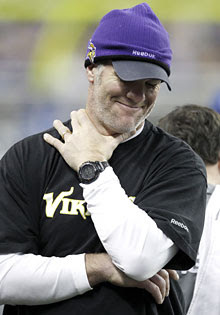 After playing 297 straight regular season games, Favre's body has had enough. He's suffered injuries to his elbow, foot, chin, neck, back, ribs and calf--plus a sprained throwing shoulder. After his last game he said, "I know it’s time, and that’s OK. It is. Again, I hold no regrets, and I can’t think of too many players offhand that can walk away and say that. Individually and from a team standpoint, it was way more than I ever dreamed of." In 2008 Favre announced retirement from the Green Bay Packers and was traded to the New York Jets. He again declared retirement after one season. (A retired player can request to be reinstated.) Then he was picked up by the Vikings and went on to have a stellar season of 33 touchdowns and only seven interceptions and going to the NFC championship in 2009. But, the 2010 season wasn't the same, with a less than worthy 6-10 record and the sexting drama. It seems that Favre is back home in Mississippi and his official Web site is selling a "Thanks for the memories" poster. A portion of the proceeds go to Favre 4 Hope Foundation, which helps disadvantaged and disabled children and breast cancer patients.